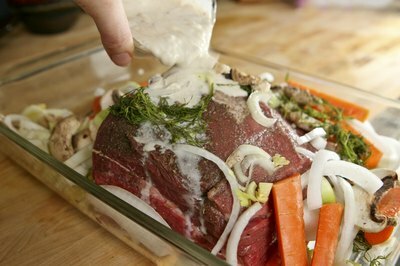 Making a pot roast is an easy way to feed a filling meal to a lot of people with just a little bit of effort. There are tons of recipes available, but almost all will take you about 20 to 30 minutes of preparation time and two to three hours to cook. You can add or substitute any of the vegetables in this recipe to suit your tastes. 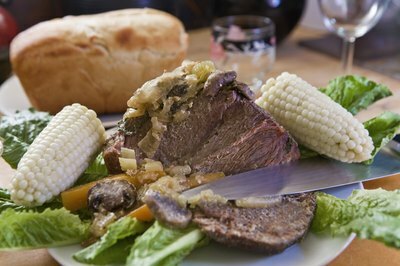 Let the boneless chuck roast sit wrapped for one to two hours at room temperature before cooking. This will help it absorb the juices better and cook thoroughly. When you are ready to prepare the vegetables, preheat the oven to 350 degrees Fahrenheit. Wash and clean all the vegetables you plan to use. Peel carrots and chop into one-inch pieces. Do the same for celery. Use small red or golden potatoes and cut into quarters. These do not need to be peeled. If you like green beans, choose fresh over canned and snap off the ends of the casings. Sliced, large mushrooms also work well. 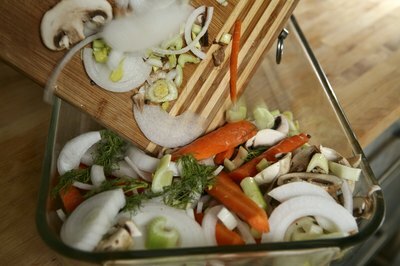 Once you prepare all the vegetables, place them into the dutch oven or roasting pan. Rub salt, pepper and any seasoning such as garlic or onion powder into all sides of the roast. 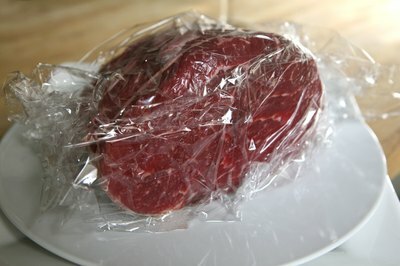 For a leaner meal, trim the fat from your piece of meat at this time. Heat the oil in a large skillet and sear all sides of the meat until they are browned. When you finish searing the roast, place it into the roasting pan. Add onion and garlic to the hot skillet for about two minutes and then place into the roaster pan. Paula Dean's recipe on the Food Network website recommends combining a can of cream of mushroom soup, 1/4 cup of red wine, some Worcestershire sauce and beef bouillon granules into a bowl and then pouring the mixture over the roast in the roasting pan. This will make a tasty gravy later. Next add the water. 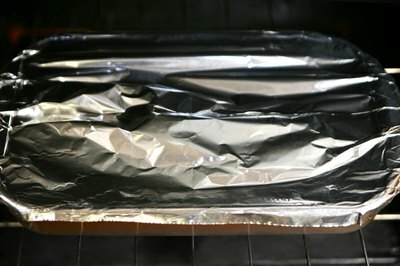 Cover pan with foil or a lid and let it bake. A three- to four-pound roast should take between three and three-and-a-half hours, and a two- to three-pound roast will take between two-and-a-half to three hours. Let it cook until tender. Remove the roast and slice into quarter-inch thick pieces and place them down the center of a serving platter. Spoon out the vegetables and arrange them on the platter around the sliced meat for a beautiful presentation. Remove the gravy and put in a gravy boat. Now you can serve your roast. The Food Network and Paula Dean recommend removing the gravy from the pot, boiling it and adding two tablespoons of cornstarch mixed with 1/4 cup of cold water to thicken it. If you want to make a pot roast but don't have an oven, try cooking it in a slow cooker. Better Homes and Gardens recommends cooking your ingredients on a low-heat setting for nine hours or on high-heat setting for four to five hours in your slow cooker. Watch your roast. You don't want to overcook it.